Ok, so maybe you'd never guess it, but this card started out to be a clean-and-simple /one-layer card. But... (sigh) I just can't seem to create those kind. I just keep thinking it needs "one more thing" until it isn't clean and simple any more. For the background I did second generation stamping with two different sentiments from Trendy Feathers to create a subtle text effect --- pretty cool, huh?! 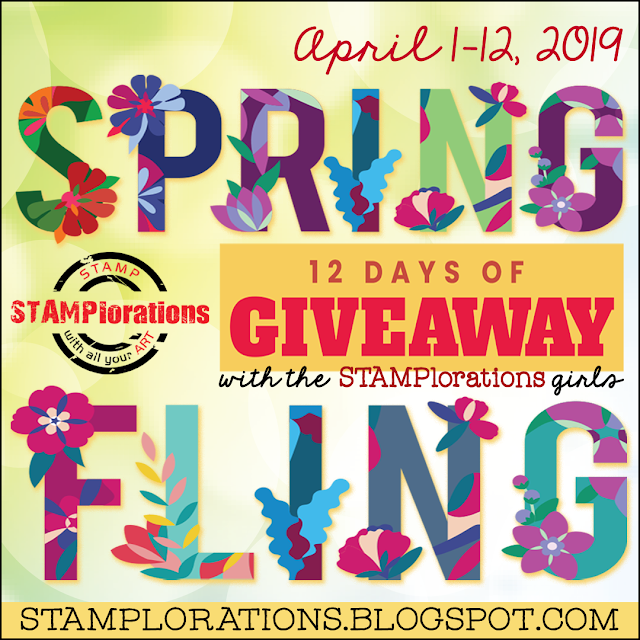 BTW - Stamplorations (the company all the stamps and dies on this card came from) is having a Spring Fling with 12 days of inspiration and giveaways - April 1-12, 2019. Amazing and gorgeous card, Esther! Love the background with the subtle text! OH my goodness - Yes, I would say you are not a CAS artist - but what you create with art is amazing to me! I love love this background very much - I just ordered me some embossing paste to dip into doing some of that type of creation with stencils - amazing work here Esther - you ALWAYS do a fabulous job on your art! Thank you for linking up to Mod Squad - hope all is going well for you too! Such a beautiful card Esther, and I love the sentiment you chose to put on it too! Gorgeous! Love the way you did the feather background to go with the bird, so neat! Beautiful card! I love the pretty blue. The card has such depth! It looks as if you were off to a good CAS start, but the elements you added and the cards beauty prove it was not meant to be CAS. Gorgeous card, Esther! Thanks for sharing with us at As You Like It Challenge this week! Love this, Esther! I need to make a couple sympathy cards and this is so very inspiring! Hugs and Happy Sunday! This card is just lovely.